Captaincy of Curaçao (incl. Aruba and Bonaire). 28 Jul 1634 Dutch invasion begun. 21 Aug 1634 Dutch colony. 1634 - 1792 Under Dutch West India Company administration. 18 Feb 1713 - 27 Feb 1713 French pirate occupation. 13 Sep 1800 - Jan 1803 British occupation. 1 Jan 1807 - 4 Mar 1816 British occupation. 11 Feb 1942 - 3 Dec 1945 U.S. occupation, Dutch administration continues. 1 Jan 1986 Aruba a separate dependency. separate entity within The Netherlands by 68%. 28 Nov 2006 Curaçao island council rejects "status aparte"
9 Jul 2007 Curaçao island council accepts "status aparte"
entity within The Netherlands 52%-48%%. 10 Oct 2010 Curaçao an autonomous country of The Netherlands. 29 Jul 1634 Curaçao a Dutch possession. 9 Feb 1635 Bonaire a Dutch possession. 10 May 1636 Aruba a Dutch possession. 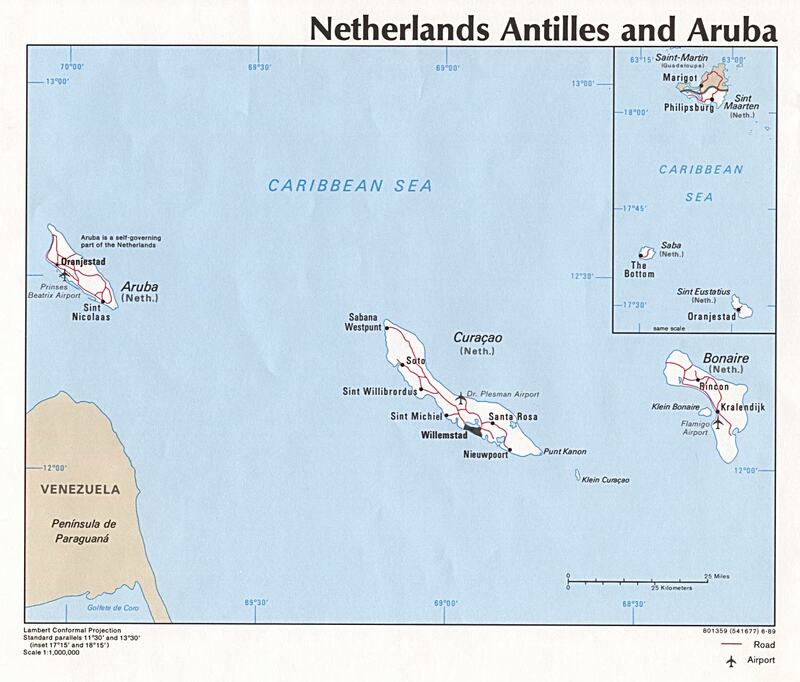 20 Sep 1948 Renamed Netherlands Antilles. remaining within the Netherlands Antilles.